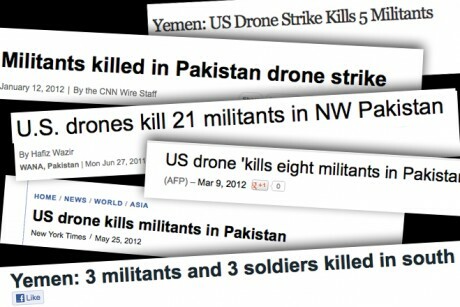 To avoid counting civilian deaths, Obama re-defined "militant" to mean "all military-age males in a strike zone"
headlines that the dead were ”militants” – even though those media outlets literally do not have the slightest idea of who was actually killed. They simply cite always-unnamed “officials” claiming that the dead were “militants.” It’s the most obvious and inexcusable form of rank propaganda: media outlets continuously propagating a vital claim without having the slightest idea if it’s true. What kind of self-respecting media outlet would be party to this practice? Here’s the New York Times documenting that this is what the term “militant” means when used by government officials. Any media outlet that continues using it while knowing this is explicitly choosing to be an instrument for state propaganda — not that that’s anything new, but this makes this clearer than it’s ever been.